Alpacas...live 15 to 20 years...grow to about 1 metre (at the shoulder)...weigh up to 70 kg...gestate for approximately 335 days…give birth to young weighing usually 6 - 8 kg. 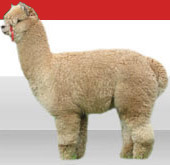 Alpacas begin life as Crias…and grow into … Tuis (Adolescents)…Hembras (Adult Females) …or…Machos (Adult Males). Are alpacas cuddly? … oh YES!! Yes, but not generally at people. Sometimes a female will spit at a male if she does not welcome his amorous attentions! If a human hit occurs, it is usually because the person has not read the signs properly … say when stepping between two squabbling alpacas. It is possible to have a single alpaca, but it is not a pleasant existence for the animal. Alpacas are herd animals and are instinctively gregarious, as are other domestic livestock. For this reason, it is usually recommended that two alpacas are the desirable minimum. It combines softness with strength. Alpaca product feels great next to the skin, yet it will have the durability of a coarser garment. It is warm, yet amazingly light. Alpaca fibre comes in a beautiful range of natural colours - white, silver, all shades of grey and fawn, chocolate brown and true jet black. And if you want to extend that range alpaca fibre will dye beautifully. Remember there are 22 natural colours of alpaca to choose from! Do alpacas need a lot of looking after? Other than annual shearing and twice-yearly vaccinations, alpacas require very little else. An occasional trim of toenails and teeth may be required. Alpacas do not suffer from flystrike or footrot. How do you shear an alpaca? Electric sheep-shearing equipment is normally used, but because alpaca fibre is non-greasy, care needs to be taken that shears do not over-heat. No, because alpacas usually give birth during the day. Birthing is generally trouble free and very quick. Crias (alpaca neonates) usually stand and nurse within one hour. What kind of pasture do alpacas need? Alpacas are pseudo-ruminants, and chew cud like a cow. They do well on low protein hay or pasture, provided it has a balanced mineral content. Supplementary feeding may help in the winter for females feeding their cria and in the later stages of pregnancy. How do alpacas affect the land? Alpacas do less damage than most other farm animals as they have pads, not hooves, so that degradation of the land is minimized. Alpacas tend to graze gently, allowing faster pasture regrowth. Their dung makes excellent fertilizer and it is conveniently dropped in areas where the animals avoid grazing. No. They are quite at ease with people and quick to learn. They can be moved easily around a farm without the aid of a dog. They can be easily transported from place to place in anything from a horse-float to a small van – we use the ‘Alpacamobile’, a carpeted Ford Transit van, to take our alpaca deliveries around New Zealand. Are alpacas related to llamas? Alpacas are very closely related to llamas. They are both from a group of four species known as South American Camelids. The llama is approximately twice the size of an alpaca with banana shaped ears and is principally used as a pack animal. Alpacas are exclusively bred as fleece animals in Australia but, due to herd size (lack of critical mass), breeding is focus in New Zealand. We do have a breeding pair of guanacos, the ancestors of the llama and alpaca, again part of the South American camelid family. That will depend on what sort of pasture and how much pasture your land is capable of producing. Different climatic regions and different soil types vary widely in their carrying capacity. A standard unit of carrying capacity is the Dry Sheep Equivalent per hectare (DSE). For example, in areas of good soil and high rainfall your property might sustain 10 DSE/ha, compared with dryland areas that might be 2 DSE/ha. As a general rule, one alpaca wether is equivalent to one DSE – alpacas eat about 30-40% less, by body weight, than sheep. If you are prepared to supplementary feed with extra hay, you may be able to increase your stocking rate. A pregnant alpaca is approximately 1.5 DSE and a lactating pregnant alpaca is about 2 DSE. In Dunedin we recommend about 4 alpacas to an acre in normal pastures - a little less for lactating and pregnant females. Any fencing that keeps sheep contained is satisfactory, preferably without barbed wire. Alpacas do not tend to jump fences but are quite capable of clearing a standard fence if sufficiently stressed. Apart from the boundary fences, the most important structure is a small yard or pen to catch the alpacas, although a temporary structure of a paddock corner and two gates is an easy-care option. Some alpacas will allow themselves to be caught in an open paddock, but even the friendliest ones tend to step just out of reach when you most need to catch them (eg. shearing time or checking toe-nails)! It is important that some shade trees are available in summer paddocks but they do not need sheds or barns. Alpacas are principally grazers but sometimes they enjoy casual browsing. They are fastidious food selectors that are highly adapted to eat small amounts of a variety of plants. Although they can survive very harsh conditions, alpacas do best on good quality pasture and benefit from having access to plant material with long fibres: eg. hay. Although some people think alpacas don’t drink huge amounts, they do need to have ready access to good quality, fresh drinking water. Alpacas are shorn once a year, usually in spring. Shearing is the biggest maintenance required and usually takes around five to ten minutes per animal for an experienced alpaca shearer. A very small percentage of alpacas are shorn standing up, but the preferred method of shearing is to lie the animals on their side and restrain their legs with a tether at each end. This protects both the shearer and the alpaca from being accidentally cut. One side of the animal is shorn and it is then rolled over and shorn on the other side. Alpaca fibre is highly prized for its very soft feel (handle), its high thermal properties, its durability, hypo-allergenic qualities and its variety of natural colours. It is processed into high quality fashion garments such as suits, jackets, skirts and coats, as well as very popular knitting yarns. Jumpers knitted from alpaca fleece are soft, light and warm. Because of its natural warmth, it is also used as a continental quilt-inner filling; Coarser fibre can be used to make alpaca duvets. Most good breeders buy-in fleece for processing as ther is a shortage - our requirements are specificaly white and light fawn fleece so please make CONTACT. We processed 1.1 tonnes in 2009. Compared with other livestock, alpacas are relatively disease free. Because of their dry fleece and naturally clean breech, fly strike is not an issue with alpacas. They do not require mulesing or crutching. They are vaccinated twice yearly with the same ‘5 in 1’ vaccine used for sheep and goats to protect against tetanus, pulpy kidney, black leg, black disease and malignant oedema. Nearly all alpacas make very good pets if they are treated well and the owners are realistic in their expectations. Given time, most alpacas will eat out of your hand and training them to lead by a halter is a straightforward process pleasant for alpaca and handler alike. Alpacas are naturally curious and intelligent and if you let them approach you, rather than rush at them and expect an affectionate response, the interactions can be very rewarding. Alpacas can bond well with other types of animals. Naturally, alpacas and large aggressive dogs are not a good combination, but there are many cases of quiet dogs mixing well with alpacas. Alpacas travel very well in a van, covered trailer or horse float. Most alpacas will sit during the journey and travel best in the company of another alpaca. On long trips over two or three hours it is advisable to plan for a stop so the alpacas can have a toilet break. Our stud males happily recognise our ‘Alpacamobile’ van which, itself, has delivered breeding females and stud services throughout New Zealand in carpeted luxury! Females become sexually mature at around 12 to 18 months of age and once they reach 45-50kg in weight. Males can display sexual interest from a few weeks of age but are not sexually active or fertile until 18 months to 3 years of age. (There will be individuals that fall outside this age range.) Alpacas do not have a breeding season and, providing they are receptive, females can be mated at any time of the year as they are induced ovulators. The average gestation period is 50 weeks (11.5 months), but pregnancies that go for over a year are not uncommon. Births are generally trouble-free and most occur before the middle of the day. Cria should be 6-8kg at birth and most will be on their feet and drinking within 2 to 3 hours. Twinning in alpacas is extremely rare (approximately 0.0025% of births) and should not form any part of a breeding plan. The good news is two sets of twins were born in New Zealand through 2004-2005 … and have survived happily … and three pairs since but not to the same mum or family group - completely random! There are a number of things to consider before launching into the breeding industry. Firstly, it is best to talk to as many experienced breeders as possible. You will gain lots of useful information from people who have already done the leg work! We farm over 200 alpacas and are happy to discuss furtehr any questions you may have - or to take the opportunity to visit and observe the characteristics and farming knowledge to help farm your alpacas. Some people have bought a couple of wethers to begin with, and once they feel confident that alpacas really are extremely easy to manage, they then take the next step to start a breeding herd. For most breeders, they simply want to get going as soon as possible and enjoy the experience as they learn along the way!!! So please come and see these wonderful animals! Please make Contact for us to send some information or arrange an appointment to visit. We do have a comfortable, heated farmstay accommodation unit with spa - sleeps up to 5 adults - if you want to make a longer visit to see our large herd and .... talk 'Alpaca'!